You just can’t miss cooking this Kootu! 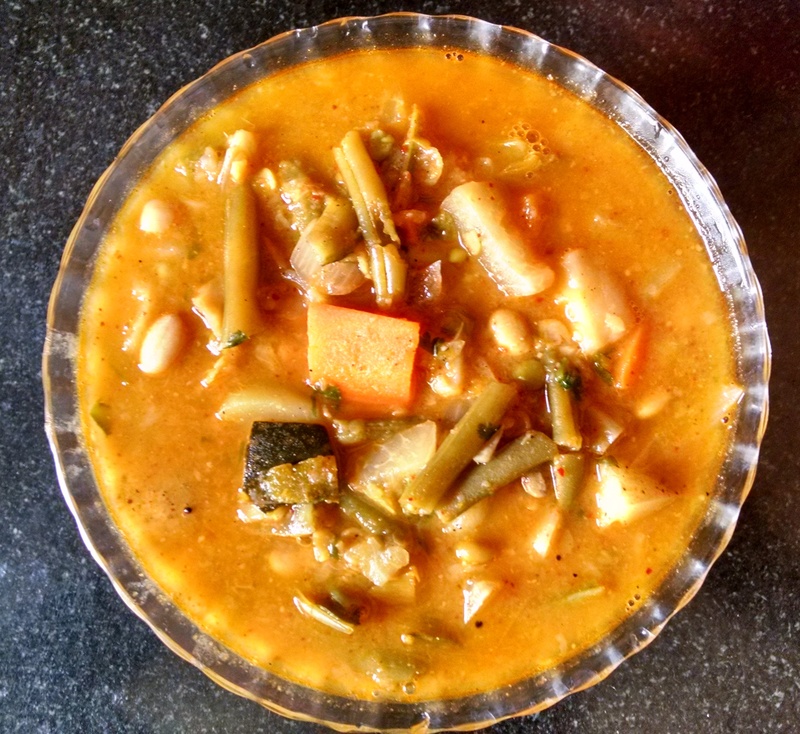 A veritable vegetable medley, this South Karnataka speciality is the spiced up version of sambar. Kootu befriends almost all vegetables, pulses, cereals, grains etc. Together, they make a nutritious, sumptuous, delicious dish that is served even during special occasions. Wash dhal with water, drain and keep aside. Wash all vegetables, curry leaves and coriander leaves in salt water. Drain and keep aside. Cook dhal in a pressure cooker along with water, turmeric powder and a dash of ghee. Peel the skin of Knol khol, carrot, sweet potato and onions. Remove the ends of beans. Chop potato, knol khol, carrot, cabbage and onions into cubes and beans into 1” long pieces. When tur dhal splits, add the chopped vegetables. Also add salt. Switch off the flame when you hear 1 whistle from the pressure cooker. Let it cool. While dhal and vegetables are being cooked…. You can do dry frying. For this, first, grate the dry coconut. Heat a medium sized kadai. Dry fry the grated dry coconut. Transfer it to a plate. Let it cool. Now start dry frying the rest of the ingredients listed under “For grinding” one after another separately and keep transferring each of them to a plate. Let them cool thoroughly. Grind the dry fried ingredients (except dry coconut). Now add dry coconut and grind to a fine powder. Mix this powder in a bowl of water uniformly . Add this to the cooked dhal and vegetables. Also add ½ tsp of salt and tamarind paste. Boil for about 5 to 10 min. When you get the fragrant flavour of kootu, its the right time to get ready for seasoning. For this, heat ghee in a small skillet. Put mustard seeds. When they crackle put broken red chillies, curry leaves and switch off the flame. Add asafoetida. Immediately pour it on to the boiling kootu. Khara Kootu is now ready. Onions can also be fried separately and then added to other vegetables and dhal towards the end of boiling.